Bologna Business School's executive MBA is an intensive part-time program designed to develop new leaders for innovative companies. The international module at COPPEAD will address the issues and opportunities of fast developing countries. Europe's only fully postgraduate university, renowned for its high quality teaching and research and its strong links to industry and business. FIU's EMBA program delivers a total graduate education experience preparing students for new and expanding responsibilities. The Post-Graduate Program in Management for Executives at IIMA is one of the finest one-year, full-time, residential programs in the world. MIRBIS program aims at high-achieving businesspeople who are looking to enhance their education without interrupting their careers. The University aspires to become a global reference point for educational innovation. The International Module at SJSU Lucas Graduate School of Business offers a “Silicon Valley Experience for International Executives”. USB offers participants unique perspectives on doing business in Africa, from managing complexity to leadership development in a multicultural setting. The EMBA Consortium for Global Business Innovation is the result of a collaboration by eleven business schools located in important world cities and regions intended to enrich our respective students’ educational experience. Our underlying philosophy is that by offering a global portfolio of geographically focused programs, our students can confront the reality of doing business in vastly different settings in ways that reinforce previous learning and experiences and provide an important global perspective on business innovation, critical in today’s environment. By living in and learning from different markets, teachers, colleagues, companies, government institutions and cultures, even if for only a relatively short period of time, the senior executives in our EMBA programs attending the Consortium will experience a paradigm shift that will serve them well for years to come. Participation in this Consortium offers a number of significant benefits to our Executive MBA students that go beyond those obtainable in a traditional MBA program offering. Students will profit from direct, in-depth observation of a different business environment and from exposure to major international companies based in distinct geographies with skills and capabilities derived from a different institutional and resource base. The international modules contain materials that emphasize a specific area of expertise, industry focus, and geographic characteristics that each partner school brings to the consortium based on their own expertise, and which includes conferences, panel discussions and corporate field trips conducted by each institution. Participants will gain from close interaction with the best minds from industry, government, and academia in important countries in the global economy. Perhaps more important is the opportunity to learn from and network with Executive MBA students from other schools and nationalities in an intensive work and social environment. This week-long program provides executive MBA students with in-depth exposure to the experiences of businesses in different parts of the world as they cope with new challenges from local and global competition. The focus is on innovation in terms of business models and not just technology. The program is a value-added component to the standard EMBA curriculum that goes beyond the content of traditional functional courses and electives. We aim to broaden the participants understanding of global and competitive issues and to enrich the content of the partners’ respective programs. Because the Consortium program is open to our schools’ EMBA alumni (on a space available basis), participants can benefit from such rich exposure to different parts of the world in subsequent years. Our EMBA students can sharpen their understanding of global competition and opportunities in a dynamic and cumulative fashion. "EMBRACING GLOBAL BUSINESS OPPORTUNITIES TOGETHER"
This conference is jointly organized by EFMD (European Foundation for Management Development) and Keio Business School (KBS). Corporations and Business Schools get together and discuss the directions and actions to take for further internationalization of their strategies and organizations. FIU Business and its School of Accounting have been reaccredited for a standard five-year extension by AACSB International, The Association to Advance Collegiate Schools of Business. FIU Business is part of an elite group of universities that hold a specialized AACSB accreditation for their accounting programs. The extension of accreditation covers FIU Business’ undergraduate, masters, MBA and doctoral business programs as well as the bachelors and masters degrees in accounting. Dr. William Hardin, director of FIU Business’ Hollo School of Real Estate, has been awarded the David Ricardo Medal, the highest recognition by the American Real Estate Society (ARES). The award recognizes a person who has created a significant body of published research in academic and refereed professional journals, spanning at least two decades. Hardin received the Ricardo Medal April 12, 2018 at an ARES meeting in Naples, FL. The Ranking is based on a survey of deans of foreign business schools and based on the international influence of the business school itself. MIRBIS took the 3rd place in Russia after St. Petersburg State University and Moscow State University. "MIRBIS Institute once again took a high position in the Eduniversal International ranking of business schools. This year, we have taken the 1st place in Russia in the category 4 palmes of excellence, with 26% more votes than last year. This shows the recognition of our business school in the international market of business education and progress in improving the quality of education provided by our business school", said Rector of MIRBIS Institute Maxim Zhivaev. Cranfield is ranked in the Top 10 international one-year MBA rankings published by Forbes. Read the article. Cranfield is also ranked no.1 outside the UK for Supply Chain/Logistics. Read the article. 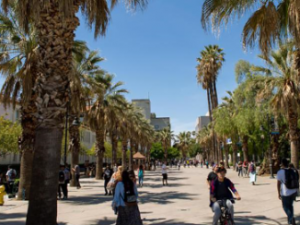 SJSU #23 on Forbes list of top public colleges with highest mid-career salaries for graduates. Read more. 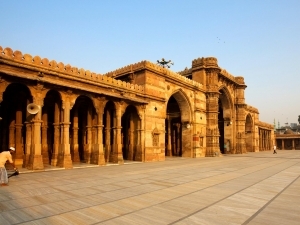 City of Ahmedabad in the state of Gujarat, India, the site of our partner IIMA, has been officially designated as a World Heritage Site by UNESCO. Bologna Business School is ranked #2 in Italy by Eduniversal business school rankings, and is awarded 4 “Palmes of Excellence” as a top business school with significant international influence and a dean’s recommendation rate of 336%. Monday, October 10th, 2016 - College of Business ranked Top 5 by U.S. News for international business programs. College of Business ranked Top 5 by U.S. News for international business programs.